This post has replayed in the minds of many this week. And opened conversations that needed to be had. Michael’s post takes some processing. 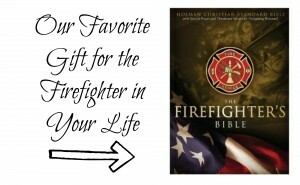 I’m going to try to process here out loud in blog world as a fire wife and someone who has immersed herself in the fire industry only in the past few years, in an attempt to take it to the next level. Perhaps to help someone else process. Perhaps because I’ve already processed this topic over and over and want to say more. Perhaps because like many of us, I want to be a fixer and make the hurt go away. There are lots of reactions to this because it’s raw human emotion. This post talks about the ugly. And we just don’t know what to do with that. There’s the classic response “God bless all of you who do that job.” Oh yes. God has blessed them all right. Because this isn’t a job for everyone. I’m grateful that people recognize that but I can’t help but sometimes get irritated at that trite response. Perhaps it’s because those people haven’t lost days and nights and weeks to a depressed or angry spouse trying to manage day to day when his mind is stuck at that one call. Bless those who are passing the blessing. That’s all they know to do. You’re reading this most likely because you’re immersed in the real life story shared in that post. And you’ve got the scars to prove it and understand where I’m coming from. But then there were the reactions of some fire wives that really stuck with me. “This is my biggest fear. Will there be anything of him left for me to enjoy?” That thought made me so sad. So very sad. Because what are we living for today? Right now? Oh my goodness we must be living in these moments because tomorrow’s simply aren’t promised. What if we spin it like this? Maybe I’m too logical and pragmatic and it may come across as heartless. I hope not but I sort of see it this way. This is where we are and we must make the most of it. Not just make the most of it but remember it’s a privilege and honor that hasn’t been given to everyone. I believe God does not give us more than we can handle. So Read on, learn and have a plan…..God doesn’t also put you in these battles without all the tools you need for victory, abundance and wholeness of life. Like the article says….when do you know you’ve reached your limit? When your time in the trenches is complete? We have choices. Maybe 5 years was your limit. Maybe 25. Maybe 13. I have a feeling it will be different for everyone with so many factors. How many runs. How the shifts are scheduled. How tight a crew is. How well a department provides support and assistance. How strong their marriage is. Even if someone is right now stepping up with research, studies and regulations to protect people from the dangers of too much emotional stress so we need to step in and make our own decisions, it’s too late for most of us reading this post. Our first responders have wounds. It’s uniquely personal. And I, for one, am not going to sit back and be a victim of that. I’m looking for those tools we were given to make it through. Yes these first responders were made to be the ones to do this tough work. But I believe they were also made to live a life that honors the most people. 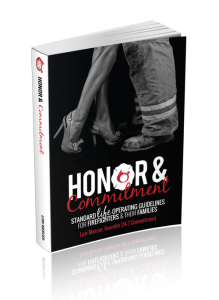 It doesn’t matter how many horrific auto crashes a first responder runs on if they are heading home and lashing out at their spouses and children as a result of the stress. Spouse and parent are the two first important titles in life, before first responder. So look for these signs and address it. Learn to deal with the emotions in a healthy manner. I know someone is going to freak out when I say this but perhaps it’s time to step back from the fire service for a bit? Or take a turn at a less busy station? Or take the pay cut to move to a lower paying department. Those who know us know that my husband had that opportunity 3 times in his career and we never came to agreement on it as a couple. Deciding to remove $20, 30 or 40K from your families annual budget are tough marital conversations. Those decisions haunt us now as he’s 12 years into sleepless nights of dead heroin addicts, abused children and mangled car crash victims. No time to re-hash the past and dwell there but we look at those options much differently now that we’ve hit our mid-forties. Maybe I’m trying to be too much of a fixer but when I see large communities of women with their own aching hearts over this post, I feel I must speak up and represent and say something. Let me try to wrap this with a summary instead of this emotional ramble…. #1 I totally agree with the author. Maybe 20 years is the max. Maybe it’s a different number for you. But that’s a whole lotta heart ache for one soul. #2 Everyone always has a choice for how to spend their days. Always. There is always a way out. If it’s too much, there are ways out. Honorable ways out. A slower station. A promotion or lateral transfer. A step out of career firefighting and maybe into a part time position. #4 I’m so ready for action. Let’s not make this just another “yeah that’s how I feel” blog article and facebook post. Can I challenge you to reflect on this topic? Have the tough conversations and think through your values and priorities. Get the help you need right now to soften the impact. Counseling. Peer support. More vacations away. More exercise. More meditation, prayer, journaling. Have your health checked – techniques, medications, surgeries for better sleep and relief from physical contributions (see our victory with Low T here). If you are struggling with PTSD, stress, etc, you can find many free resources here at our crisis page. Retirement plans: Just this post prompted my husband and I to solidly get on the same page about retirement. Not that we hadn’t had the conversation but things became crystal clear. If nothing changes significantly at his department (promotion, schedule changes, departments merging, dream up whatever scenario you want because all kinds of crazier things have happened in the fire service) we both agree we are on the 13 year count down and out. No amount of “DROP” money can buy back joyful hearts and healthy spirits. He will be 58 and I’ll be 54. Those are relatively young ages to still be able to really live. Give back. Start something new. Still be able to command an income. And let’s be straight. There are not many industries that you can retire with a pension at that age. (I know, I know. Drama and distrust and frustration with pensions. Not going there this post.) I’ve worked in the corporate world for 20+ years and this year I have watched 3 dear co-workers retire with 38-40 years of service each, still not able to draw from their 401k without penalty. Because of the fire department pension, that won’t be me. That’s our plan. Don’t judge or pick it apart. That’s not what I’m asking. Just take an action and make your own considering the very important message in Michael’s article. How long is enough? How long until we wear out our hearts? Thank you Michael Morse for bravely sharing that post and helping us all face a difficult topic head on. 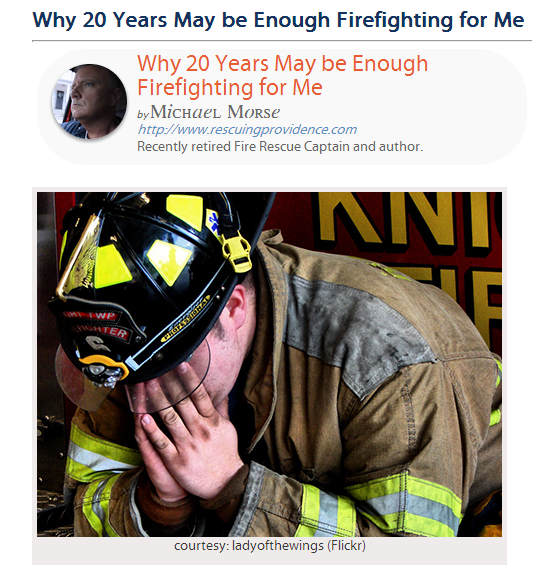 Great post and topic…we’re a handful of years into the fire life and are already preparing for who-knows-what with different streams of residual income for this very reason…I want my Amazing husband to be able to leave anytime he needs to.